Bruce Willis has played a lot of cops in his time, and at the start of 16 Blocks it looks like the strain is finally beginning to show. When we first meet Lieutenant Jack Mosley, the character Willis plays in Richard Donner‘s film, he’s about as far from the heroic, wisecracking John McClane as one could imagine. With a pronounced limp and a boozer’s belly hanging over his belt, Mosley ambles his way into an early morning crime scene and, after searching the premises for alcohol, he slumps heavily into a chair and begins to drink his troubles away - starting the day as he means to go on. This is not a Bruce Willis we’re used to seeing. His appearance and his actions instantly makes us sit up and take notice; is this guy really the film’s hero? He looks like he can barely walk in a straight line and his reputation among fellow officers is pretty low too. Mosley is given basic babysitting duties to carry out, tasks that even he can’t screw up, like watching over a crime scene or transporting a prisoner from jail to the courthouse. The prisoner is Eddie Bunker (Mos Def), a star witness who is due to appear in front of the Grand Jury, and Mosley only has to take him to a destination 16 blocks away; but when some violent attempts are made en route to ensure Eddie’s silence, Jack has to sober up fast. The set-up’s a good one. 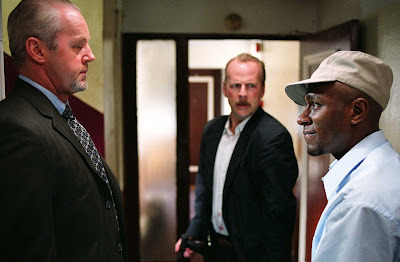 Eddie was due to testify against a dirty cop so the killers on their tale are actually a number of Jack’s colleagues, led by his partner of twenty years Frank Nugent (a nicely malevolent turn from David Morse), and Jack must get his charge to court before 10am or the whole case will collapse. 16 Blocks unfolds in something pretty close to real time and as Jack and Eddie lead us on a cat-and-mouse chase across New York, it’s often a breathless, thrilling ride. 16 Blocks is something of a return to form for director Richard Donner, whose output since the glory days of his Lethal Weapon franchise has been mediocre at best and Timeline at worst. Here, he seems to have regained some of the snap and fizz he injected into his earlier pictures, and the opening half hour of 16 Blocks is sensationally good. After a few moments in his car, with the non-stop, nasally chatter of Eddie driving him mad, Jack pulls over to fill up on alcohol. When he emerges from the bar, he finds two gunmen about to shut Eddie up permanently and after a brief shootout, Jack and Eddie speed away from the scene with all the corrupt cops in the NYPD on their tail. All this is brilliantly orchestrated by Donner, but after a cracking start he soon begins to let things slide. The action becomes unfortunately predictable and plausibility is stretched to breaking point as Richard Wenk’s screenplay contrives a series of predicaments for our heroes to become embroiled in. The film’s real-time gambit should lead to considerable tension but 16 Blocks occasionally feels longer than its 105 minutes, with the brief flurries of action followed by inert scenes in which a large amount of unnecessary exposition is gracelessly brought into the picture. 16 Blocks never quite manages to recapture the electricity of its opening, but it always holds the attention; and much of that is down to the interplay between the two leads. Bruce Willis is a reliable leading man and here he gives his usual solid, committed performance but with a little bit extra thrown into the mix. The term ‘world-weary’ doesn’t begin to do Jack Mosley justice. His heavy-lidded expression, crumpled suits and shuffling gait hint at a life in which any sense of pain or guilt has been washed away in a tide of alcohol. Jack is a dirty cop, a lazy cop, but he’s a good man at heart; and his awakening sense of righteousness is convincingly etched by Willis in a thoughtful, generous performance. As the other half of 16 Blocks’ central odd couple, the unusual portrayal of Eddie Bunker is more of a test. Rapper Mos Def has already shown himself to be a fine and subtle screen actor, but or some reason he has adopted a bizarre nasal whine for this role - like some unholy cross between Bugs Bunny and Jerry Lewis - which makes this talkative character almost unbearable at first. “I believe that life is too long and people like you only make it longer” Jack groans after a mere couple of minutes in Eddie’s company, and few audience members would be inclined to disagree with him at this point. But then something strange happens, we start to like the guy. I’m not sure how or when this change of perspective occurred, but before too long I really began to care about Eddie’s fate. Mos Def invests his character with a strong sense of humanity and skilfully avoids the pitfalls such a potentially stereotypical character could fall into. He and Willis have real rapport, the bickering interplay between them is snappy, and Donner once again proves his expertise at handling such buddy movie dynamics. It was a daring move to present us with a character this irritating and expect him to grow on us the same way he does on Jack, but full credit to all those involved for pulling it off. 16 Blocks just about manages to keep on track towards the climax, but it almost careers off into disaster in the final third. Wenk overreaches himself by trying to take things onto a bigger scale and, after some drastic, not wholly convincing changes of heart by the central characters, the film’s ending seems to be pushed far beyond its natural length. It doesn’t help that Donner has emptied his box of tricks by this point and his direction has become repetitive and sloppy - with his over-reliance on ‘trick reveals’ a particularly cheap way of generating tension. His determination to steer this movie towards a happy ending, whatever the cost, also works against it, with cheap emotional coercion the order of the day in the final third. 16 Blocks is almost two movies in one, with the gritty, violent, 70’s style action of the first half seemingly at odds with the moralising and manipulative nature of the second. Ultimately, it just about works enough of the time to make it worth seeing, and the chemistry between Willis and Mos Def raises the standard of the whole picture a notch or two. It’s a bumpy ride from the jail to the courthouse, and the filmmakers often take an unfortunately circuitous approach, but Eddie and Jack are pretty good company for the journey, and it’s by no means the worst 16 blocks you’ll ever travel.